Here’s a happy photographer! For months I’ve been wanting a replacement for my Nikkor 18-55mm f/3.5-5.6G kitlens. I read every article I could about a proper upgrade, every review, every forum on the subject. I even posted a question myself on the Dutch Nikon forum. My question was simple: what to do? I want a better lens, I want more light, and I want more range. The more I read, the more difficult my quest became. Would I go for the Nikkor AF-S 16-85 MM F/3.5-5.6 G VR? It had a bigger range, but the F number is the same. Why didn’t that come in F/2.8? Would I go for a 35mm prime? For a Tamron 17-50mm F/2.8? Everyone had different opinions about it, but in the end it was me who had to decide. And being so scared of making the wrong choice, for a very long time I made no choice at all. This morning I went to Camera.nl in Barendrecht, to have my camera cleaned. I woke up very early this morning, checking all the readingmaterial again. And even as I stood there, with the Nikkor 16-85mm and the Sigma 17-50 2.8 EX OS HSM (this is a Canon test), trying them out, I couldn’t make a decision. For a second I thought ‘oh screw it, never mind, I’ll buy a new lens when I really know what to do’. Then my dear photography friend J, who was with me, said: ‘don’t listen to the guy who wants to sell you something else. Remember what you wanted when you walked in here this morning.’ And then I knew: I don’t want to push the ISO all the time, I want to be able to photograph properly, inside. So I went for the Sigma 17-50. I’m so happy with my choice, it’s a beautiful lens! I tried it out on J while we were waiting for the bus. It’s a shame I can’t post the photo here -she pulled a, let’s say, funny face!- but the photo was amazing, I saw that right away. So sharp, so light, so crispy clean! At home I tried it out on my cats. 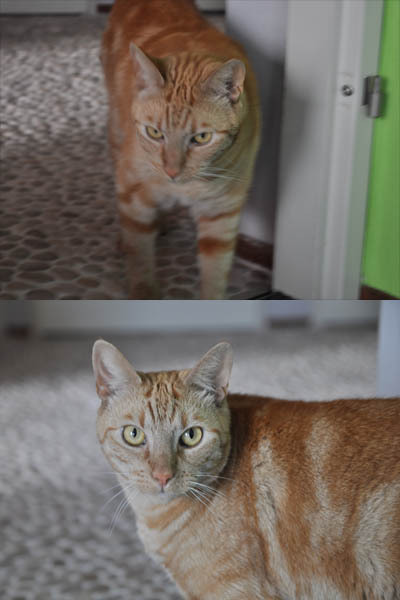 Of course they’re horrible in not sitting still, but even then I just see an amazing difference between my kitlens (top photo) and my new lens (bottom photo) (enlarge to see a bigger picture). I’m happy with my lens, but I’m even more happy that I don’t have to think about it all the time, anymore. So I don’t have a bigger range, but I realised (someone on twitter thankfully asked me that question) that I find a F/2.8, the whole way through from 17 to 50mm, much more important than that extra 55-85mm. I can always buy another lens for that. So it took me a very long time to make a decision, but once I made the choice (helped by returning to my intuition), I knew it was the right one. Here’s a very happy photographer! And here’s just a cute cat for ya!